Final day of the Oak Ridge Fall Velo Classic. 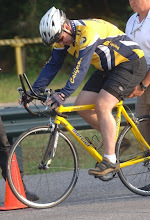 Today's event was the "Criterium" -- an event much like NASCAR on bikes. The course, a fast 0.9-mile loop on the south slope of Blackoak Ridge, traveled around historic Jackson Square. While a "Criterium" can often be a spectator sport (especially around the turns, where a tightly-packed group of riders can all fall with the slightest provocation), the first four heats of today's ride had no accidents. 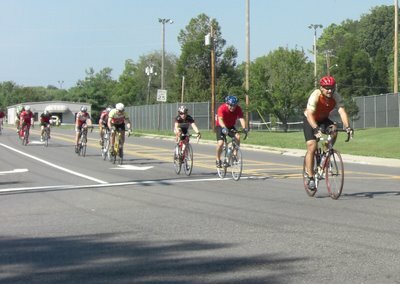 The photo above shows the "Cat-5" group cycling eastbound on Tennessee Avenue; I'm the fat guy with the yellow bike. After our allotted 25 minutes, I had amassed nine (9) laps -- while the winner completed 11! Rochester NY had a criterium a few weeks ago, the course is a mile long over two bridges and including a hairpin turn. A lot of people show up to watch too, it's a good time, there were a couple crashes too.